Hobart Hurricanes have made one change to their squad of 13. All-rounder James Faulkner is back into the mix replacing Tom Rogers and most probably he would be replacing David Moody in the eleven. Jackson Coleman has been omitted from Melbourne Stars 13-man squad. Nick Larkin has been named as a replacement for the injured Travis Dean. Glenn Maxwell (C), Jackson Bird, Peter Handscomb, Sandeep Lamichhane, Nick Larkin, Dwayne Bravo, Dan Worrall, Adam Zampa, Ben Dunk, Seb Gotch, Evan Gulbis, Nic Maddinson, Marcus Stoinis. 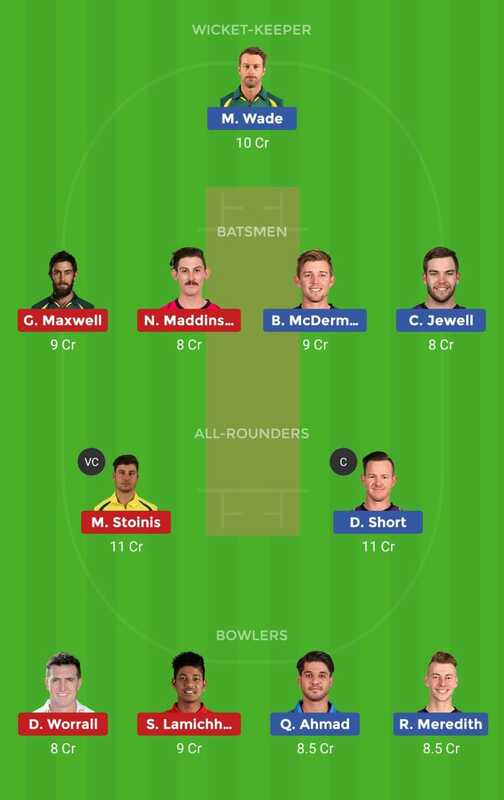 Matthew Wade (c and wk), D’Arcy Short, Caleb Jewell, Ben McDermott, George Bailey, Simon Milenko, James Faulkner, Jofra Archer, Clive Rose, Qais Ahmad, Riley Meredith/David Moody. Marcus Stoinis, Ben Dunk, Peter Handscomb (wk), Glenn Maxwell (c), Nic Maddinson, Dwayne Bravo, Seb Gotch, Sandeep Lamichhane, Jackson Bird, Adam Zampa, Dan Worrall. ℹ Must Watch Video & You can make changes from guide. Watch Video for other C & VC Options & GL Combination.